This may be the last weekly Cheerful/Fearful. This is not due to my recent laxness in posting, just the fact that as the weeks have gone on I've found that whilst they are easy to write, Cheerful/Fearful are difficult to research, as my rather strict guidelines for which films should be written about means that I wind up struggling to find films that compliment each other (this is best exemplified by the Jennifer's Body/Sorority Row entry, which is a bit wishy-washy). I think I'll do them monthly from now on as that will give me ample time to choose corresponding films. 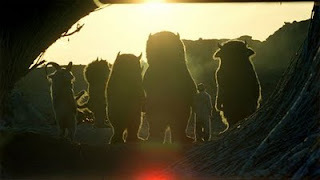 Anyway, this week's installment concerns a film that I just could not be more excited about if you paid me (though if anyone would like to pay me to be excited about films then I would be open to any offers), it's Spike Jonze's adaptation of Where The Wild Things Are. For the longest time I was worried, nay skeptical, about the film version of Maurice Sendak's book, widely acknowledged as a classic. I read it as a child and fell in love with its story of a young boy who creates an imaginary world of creatures (the titular Wild Things) when he is sent to his room. It's an imaginative and evocative story that really spoke to the wide-eyed little bundle of energy and ideas that I was. It seemed impossible to me that a film could capture that sense of wonder and joyous invention. Then, I saw the Trailer. Needless to say, my skepticism has drowned in a wave of sheer glee. Much has been written of the trailer, the consensus seems to be that it is one of the most exhilarating of recent times, and I don't think that I can add too much to the debate. I will say, though, that it encapsulates in its 2 minutes and 8 seconds all the joy, hope and fear that we feel as children. It manages, in so short a space of time, to evoke the unfettered imagination of childhood and its scope reflects the boundless horizon that children see in the world around them. If the film fails to deliver, at least it created a trailer that so wonderful recreates the concept of adventure and fun that we only seem to find in childhood. The most striking thing about the trailer, and the fact that a film has been made out of the book at all, is how big it feels. I re-read the book recently and, aside from being struck by how much of a chord it struck with me a good 15 years or so after I first read it, the most surprising thing about it was how short it was. It's only 40 pages and nothing happens. It doesn't happen in the best possible way, but it's still not exactly an action-packed read. Reports suggest that Spike Jonze and his co-writer, David Eggers, have got around the problems of there being little actual story by making it about characters, focusing on the relationship between Max (played by the awesomely-named Max Records in the film), his mother (Catherine Keener) and her boyfriend (Mark Effing Ruffalo!) in the real world, and his relationship with the Wild Thing Carol (James Gandolfini, who continues to be one of the greatest people ever). They seem to have found an emotional core around which to build the film and, based on his previous work with films like Being John Malkovich and Adaptation, Jonze seems the right man for the job. He's perhaps more renowned for his visual style but he can handle characters better than most directors and he can really make you feel for them. He even managed it in his music video work, as you can see in his sad and hilarious video for Daft Punk's Da Funk, which is really just a short film that happens to have a Daft Punk song in the background. The film has had a storied and troubled production, with repeated delays and allegations that Jonze was forced to reshoot scenes after a test screening in which suits (and the men inside them) became worried that the film would be too dark for children, which seems somewhat oxymoronic to me. Criticisms of test footage that was leaked last year have also caused concern, though since the finalised images have started to come out, demonstrating the seamless way in which actors in suits are combined with CGI facial animation these objections seem to have died down. In the past I've said that a troubled production is not necessarily a bad thing since it can represent a healthy exchange of ideas and the desire of those involved in to get the film just right. Since there doesn't seem to be any animosity coming off the film so far, I'm inclined to believe that Jonze is happy with the film and has produced what he wanted and that we will soon finally be able to see what he has wrought. Here's hoping that it promises everything the trailer does and more. Let the wild rumpus begin!